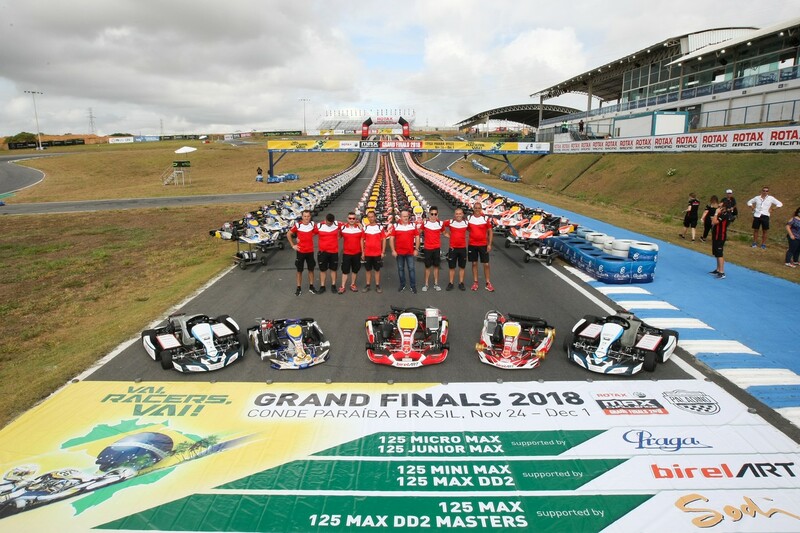 The Rotax Max Challenge Grand Finals have officially kicked-off in Brazil where the 2018 Rotax calendar’s pinnacle-event is taking place on the Circuito Internacional Paladino of Conde in Paraíba. This impressive Finale of the karting season sees 360 drivers coming from 55 countries during the 19th edition of this famous race. The Circuito Internacional Paladino is located in the Northeast of Brazil, a tourist and industrial hotspot, also known for its rich cultural heritage and beautiful beaches. Paladino is a popular choice for drivers as the circuit provides both speed and ample passing opportunities. On Saturday 24th November, drivers were able to register for the event, undergo scrutineering while some used the track’s hire karts as an opportunity to experience for the first time the circuit they will be competing on all week through. On Sunday 25th November, the sun was out when the gates opened and the amazing line up of over 360 brand new Karts from Rotax’s Chassis Partners (BirelART, IPKarting (Praga) and Sodikart) could be seen on the main straight and into the distance up the hill on the circuit. But there were periods of rain throughout the Kart Raffle, where the drivers and their mechanics finally got their hands on their randomly chosen Kart and Rotax engine packages. Along with these, they received all the tools and equipment they needed to assemble their karting package, beneath the massive driver tent. For the first time in Rotax MAX Grand Finals’ history, there was some on-track action on Sunday with the first Non-Qualifying Practice for the E-Karting Cup FIA-Americas 2018 (EKC FIA-Americas 2018) along with Qualifying Practice and Pre-Final. These classes all race with the Rotax THUNDeR kart and will be showcased with more racing throughout the week. After all the hard work was completed in the paddock, the drivers and their supporters could look forward to the Welcoming Party being held at Paço dos Leões (Lions Palace) on Sunday night. This gave everyone involved a chance to come together and celebrate the spirit of Rotax karting. The feeling of competition was present as well with both the Team Contest and the qualifying rounds of the MOJO Tyre Changing Contest being held during the evening.